Over the past few days, I have had the opportunity to play Wits & Wagers with a lot of different people. Most of them are not gamers who would play any game that would be considered 'heavy', or even 'medium' weight games, and most typically play only when my husband and I bring our games to them to play, but there were some 'real' gamers, too. However, gamers and non-gamers alike LOVED the game! So I started looking on BGG for reviews and such and was suprised that the couple of comments that have been made weren't really all that favorable. Are we the only family that loves this game? According to the one description of 'how to play' it seems we did play correctly. The commentor (in one of the threads on BGG) remarked about the 7th answer betting could allow one individual to pull out ahead. To our group(s), we called this round "all in" and enjoyed watching and laughed as everyone scrambled to see what 1 or 2 answers people were betting on before the timer runs out. And this question does end the game, so there is some thought as to whether you hold back some chips or not. Of course if you're playing with a bunch of folks with high IQ's I suppose it could be boring since everyone would know every answer, but we found that those at the table that normally do really well at Trivia Games didn't usually come up with the exact answers and very seldom pulled out the win. 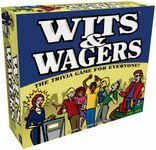 I thought the biggest plus to this game was the fact that you didn't have to know anything about Trivia to enjoy the game. I, myself, don't really enjoy Trivia games because I am not one of the 'brainy' people who knows all the answers. I sometimes agree to play only because I can be on a team. In Wits & Wagers it doesn't matter that I don't know the answer, it only matters who I think does know, who is bluffing and bet accordingly. To the Eagle Games and North Star: GREAT IDEA for the material used in making the board! It is made with a rubber backing and a cloth surface...like a giant mousepad, only really thin. It folds loosely to lay in the box, but unfolds completely flat on the table. I wonder if this would be an option for other 'regular' boards in games. The one negative point: WE NEED MORE CARDS! So others who have played and agree that it's a great game and that we need more cards, please add your comments and maybe Eagle Games will see it and publish a couple of sets of additional cards. My realtives have said I MUST bring the game back at Christmas with new questions and since there aren't any available, I guess it's Google-time for now! Happy Holidays! I first played this over a year agao, in a prototype form, at EuroQuest II, with the designers and a bunch of people. We all had a great time. I bought it this year, at EQ III, and we first played the finished version over the Thanksgiving holiday. It was a great deal of fun, and even those in our group who dislike party games and trivia games thought it was a lot of fun. Why not post this in Session Reports instead of here? Could be because I am a newbie and didn't know it was supposed to go there? Though it is long, I did not intend it to be a 'session' report. I was excited to share my thoughts that the game, in my opinion, is fun, but wanted to get some attention to the thread that it needs more cards....hopefully with some support of other people who love the game as well. And, I just think the substance of the board is really cool and wondered if anyone else thought so, too. Just wanted to have a little fun conversation with a few like-minded friends. I apologize if my thread is in the wrong place. Don't apologize, i'm justing thinking you should have earned some GeekGold for such a well thought out and nice writeup! Geek Gold. I know it's used to buy Avatar's and Badges and I'm not sure what other stuff and I know (or should I say think I know) people give it to you, but that's about it. I should read about it, I guess....but reading the threads is more interesting. But thanks for the compliment. I assume Geek Gold is given for Game Session Reports? I haven't had the chance to play yet, but I think I'll like it a lot. Sadly, Funagain doesn't have it in stock right now. I'm glad that all of our hard work is being appreciated!! It is great to hear that people are already wanting a new set of question cards. Unfortunately, I have a feeling it will be a while before we have enough demand to justify a booster pack of questions. On the other hand, the quicker mainstreamers hear about our game, the sooner we'll print more questions. Thanks for helping out with spreading the word! imo, this is by FAR the best Trivia game there is. Its a trivia game thats fun for gamers! The game system is brilliant, it makes it fun even if you have no clue about the answers, as you are trying to bet on who got it closest. And the questions are actually very interesting! Most trivia game questions (especially about pop culture), I have no idea, and then dont care what hte answer was, or I guess the one person I know that might fit, and am either right or wrong, and then even if I get it right, its not like I actually knew anyhing, I just guessed the right name. When you actually DO know the exact answer, its pretty awesome But usually its fun to make educated guesses. Its also fun to try and guess something thats just over what someone else put. One time, I knew the answer was between 16 and 17. I figured someone else would know this, and put 16. But they might think the smae thing and put 16.1. So I put 16.11 and was just over the guy who put 16.1 who was over the guy who put 16. I got the 10 pt bonus. It was very funny.